Dave White has been making his presence felt in the sneaker market with his impressive rendition of famous shoes like his own edition of the Air Jordan 1, which will be hitting the market today, February 11. 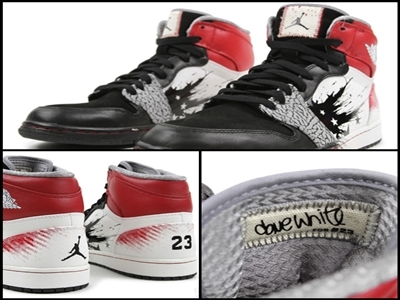 Known as the Air Jordan 1 “Dave White” or “Wings for the Future”, this multi-colored sneaker was first unveiled in the market last November 2011, and now that it will be officially out in the market, expect this one to be a huge hit starting today. As usual, the Dave-White sneaker features his trademark paint splatter and brush strokes, a feature that will surely get a lot of attention once again.